Before I left Broken Arrow, Oklahoma, I made a post on the well-known skateboard magazine website Slapmagazine.com. In the online forum I made a request for information about skateboarding in Philadelphia, such as skate spots, tips on avoiding tickets, the skate-ability of LOVE park, etc.To my surprise, about a month after posting I received a message from SLAP Pal “Carrols Chesthairs.” He was kind enough to message me his number and was willing to be my tour guide. We texted frequently trying to plan a time to meet up and skate, however the busy days of Institute made this difficult. Each time one of us would have a free day, the other was always busy. 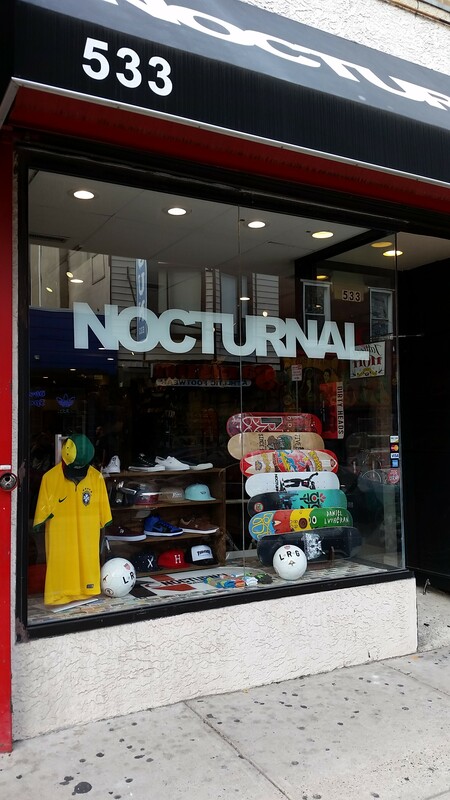 One of my goals during my stay in Philadelphia was to visit Kerry Getz’s skate shop Nocturnal. Growing up I would read about his skate shop in various skate magazines and had always wanted to check it out. On one of the few Saturdays I wasn’t busy, I decided to skate to Nocturnal from Temple. Confused, I responded with a yes. We both began laughing and finally introduced ourselves in the real world. Carrols Chesthair’s friend then made a comment about how we just had a You’ve Got Mail moment causing us both to blush heavily. I’ve always dreamed of having a rom-com moment but never thought that it would occur with another skateboarder. Afterwards we planned on meeting the next day to skate around downtown. I skated at Paine’s skatepark before skating over to a 3 up 3 down spot, which can be seen in Ishod’s Fourstar part at the 38 second mark. We spent about an hour there while his friend tried filming a line. After his friend got his line, we decided to go cruise downtown and skate/check out other spots. All of the spots Carrols Chesthair showed me were fun and exciting to see in person. We swapped stories about skateboarding in Oklahoma vs skateboarding in Philadelphia, teaching (turns out he is going to school to become a math teacher), and random skateboarding gossip. For example, a lot of East Coast skateboarders seem to be somewhat iffy about Mark Suciu. Apparently he doesn’t hang out with the local skateboarders too often and prefers to skate with only his close friends. Another interesting fact is that he chooses not to have any of his skateboard product sent to his dorm room at Temple since he prefers to have a more “traditional” college experience. Which is really rad to me. But to others, they questioned his “dedication/alliance” to skateboarding when they found this information out. Oh well. We ended our skate session at the alley-way ledge shown earlier. The spot is fun because it also has a very good curb for slappies. Overall my experience skateboarding with a stranger from the internet was a pleasant one. Sure, at times our sessions were accompanied by uncomfortable moments of silence, but we still skated and had plenty of random skate information to talk about. I didn’t get catfished, mugged, or molested, so I’m happy. Carrols Chesthair was a terrific tour guide and a great person to talk skateboarding with. A majority of these spots (and others) can be seen in the following videos Philadelphia with Mark Suciu and The Philadelphia Experiment.